Creates a version of the Source input that is subjected to Jpeg compression artifacts and errors. This can be used to give various looks of low quality digital transmissions. Three methods for manipulating your image are provided: the Jpeg quality can be adjusted, various internal frequencies can be scaled, and random decompression errors can be introduced. In all cases it can also be useful to lower the resolution factor to create larger, more obvious Jpeg blocks. Quality: Default: 0.1, Range: 0.01 to 1. Determines the amount of normal Jpeg artifacts. Use lower values for more compression. X Freq Scale: Default: 1, Range: 0 or greater. Scales the horizontal Jpeg frequencies. Values other than 1 cause abnormal results. Y Freq Scale: Default: 1, Range: 0 or greater. Scales the vertical Jpeg frequencies. Res Factor: Integer, Default: 1, Range: 1 or greater. Downres the result by the inverse of this amount, so 1 is full resolution, 2 is 1/2, 3 is 1/3, etc. The pixel shapes will be larger when this is increased. You won't notice the result of this parameter unless its value is beyond then the current viewing downres factor. Res Rel X: Default: 1, Range: 0.01 or greater. Downres the result by the inverse of this amount in the horizontal direction. The jpeg block shapes will become rectangular if this is not 1. All Freq Scale: Default: 1, Range: 0 or greater. Scales the frequencies for all Jpeg coefficients. Values other than 1 cause abnormal results, and create unusual looking blocky versions of your input. Low Freq Scale: Default: 1, Range: 0 or greater. Scales the softer low frequencies. Mid Freq Scale: Default: 1, Range: 0 or greater. Scales the middle range frequencies. High Freq Scale: Default: 1, Range: 0 or greater. Scales the sharper high frequencies. You may need a high Quality setting to see the high frequencies at all. Affect Luma: Default: 1, Range: 0 or greater. Determines how much the Freq Scale parameters above affect the luminance channel. A zero value causes no luminance change. Values greater than 1.0 exaggerate the change. Affect Chroma: Default: 0.5, Range: 0 or greater. Determines how much the Freq Scale parameters above affect the chroma channels. A zero value causes no chroma change. Values greater than 1.0 exaggerate the change. Error Rate: Default: 0, Range: 0 or greater. If positive, random decompression errors are introduced. The value determines the average number of errors in those blocks that receive errors. Larger values give a more even grainy look. Err Block Density: Default: 0.75, Range: 0 to 1. Determines the percentage of Jpeg blocks with errors. A value of .5 will give errors in half of the blocks and 1.0 will give errors in all blocks. Error Amp: Default: 1, Range: 0 or greater. 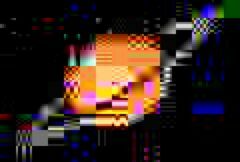 The amplitude of the decompression errors. Larger values give more visually obvious errors. This has no effect unless the Error Rate is also positive. Error Coherence: Default: 1, Range: 0 or greater. Determines how much the blocks with errors are grouped together. When zero, the errors are evenly distributed throughout the frame. When increased, the errors are clustered into larger groups. This has no effect unless the Error Rate is positive and the Err Block Density is less than 1. If this is 0, the random errors will remain the same for every frame processed. If it is 1, different errors are used for each frame. If it is 2, new errors are used for every other frame, and so on. This has no effect unless the Error Rate is also positive. Used to initialize the random number generator. The actual seed value is not significant, but different seeds give different random error patterns, and the same value should give a repeatable result. This has no effect unless the Error Rate is also positive.